Vatican Splendors presents the largest collection of Vatican art and historical objects ever to tour North America. It is now at the Museum of Art Fort Lauderdale -- one of only three U.S. venues to host the exhibition. With its record-setting success and popular demand, this new exhibition is here in Fort Lauderdale, presenting a collection of more than 200 extraordinary artworks and objects of historical significance. More than half of this new collection is comprised of objects which have never come to North America before, including many never seen outside of Rome. The exhibit features 170 works of art and historically significant objects, many of which have never left the Vatican. The exhibition is organized into 11 galleries that illustrate the evolution of the Church and its papacy beginning with Saint Peter through the papacy of Pope Benedict XVI, with thematic areas highlighting important developments, moments, people and events tied to the history of the Catholic Church and the Vatican, reflected in both important historical objects and artistic expression from different eras. From the sights and sounds of the grand Basilica to a touchable cast of John Paul II’s hand, the exhibition is a multi-sensory experience. Works by Michelangelo. Bernini. Giotto. 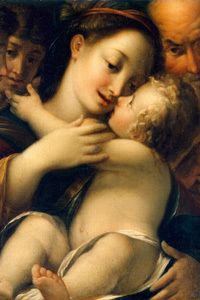 Guercino. Artwork by 15th century masters. These have inspired artists for centuries. Now you can see the compass and tools that Michelangelo used in the painting of the Sistine Chapel and work on the Basilica. Relics of Saint Peter and Saint Paul, objects from the first century, including artifacts discovered at the tomb of Saint Peter, and personal items of Pope John Paul II are part of the splendid exhibition. The exhibition commemorates the 500th Anniversary of several significant dates in Catholic history: the building of St. Peter's basilica, the founding of the Vatican Museums, and the painting of the Sistine Chapel. It’s an unforgettable experience you won’t want to miss! Opens January 29 and closes April 24, 2011.